Electrons or molecules? We need shared parenting! I am speaking with Bert den Ouden, one of the most experienced and respected energy experts in the Netherlands, currently managing director Energy at management consultancy firm Berenschot, about the Dutch energy transition. Not that Den Ouden is in any way an apologist for the gas industry. He has a wide-ranging background: he started out as an energy efficiency specialist at the well-known independent research agency CE Delft, then went to the Ministry of Economic Affairs, where he “did energy savings”, and subsequently became co-founder and CEO of APX-Endex, the Amsterdam-based electricity and gas spot market, which was launched in 1999 and today is part of the EPEX spot and ICE-Endex market platforms. In this role, Den Ouden became one of the architects of the “electricity market coupling” – interconnected power markets –that has made great headway in Europe. Den Ouden and his team decided last year to make two energy transition scenarios (“transition paths for a CO2-neutral future”) as input for the negotiations that were going on for the climate accord, one based on “Electrons” and one on “Molecules”. The major reason for the difference: the costs of the production facilities. In the Electrons scenario, two-thirds of capital expenditure and operating expenditure goes into (offshore) wind power and electrolysis, which is much more expensive than blue hydrogen, notes Den Ouden. In Electrons there is no natural gas anymore. In Molecules, there still is a large role for natural gas. As a matter of fact, 34bn m³ is almost as much as the Netherlands uses today! 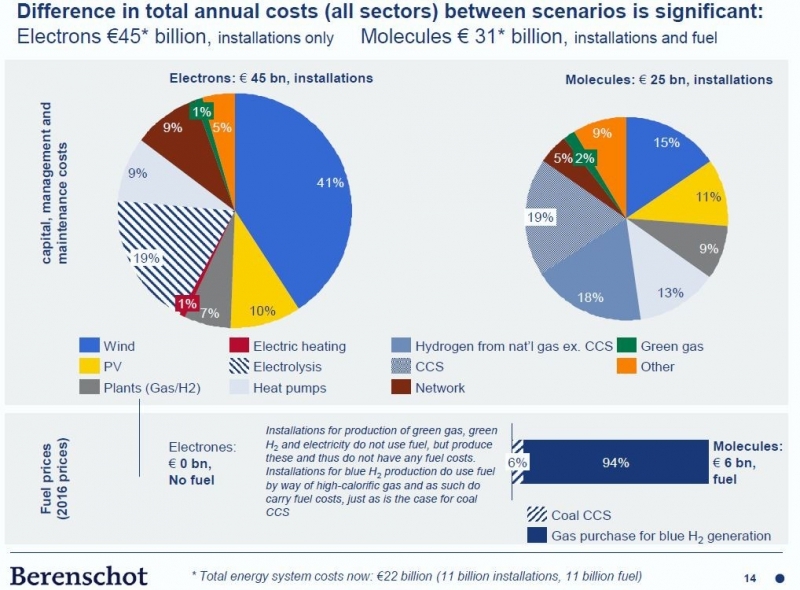 To see if the Netherlands could also achieve a pathway with lower natural gas use that would still be economically efficient, Berenschot decided to do a third analysis, called “the Heat scenario”, which was published in September 2018. In this scenario the demand for heat is met as much as possible with district heating networks which use sustainable heat sources: geothermal, solar thermal and waste heat from industry and data centres. A small amount of heat is supplied with electric heat pumps and “green” gas. The result: estimated costs came out at €38bn/yr, i.e. 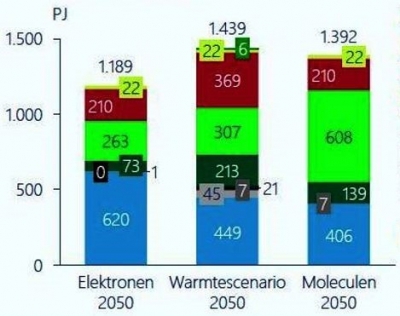 in between the Molecules (€31bn) and Electrons (€45bn) scenarios. Much of this cost is due to the need in this scenario to build a large-scale district heating network to replace the existing gas network. At this moment there is very little district heating in the Netherlands. 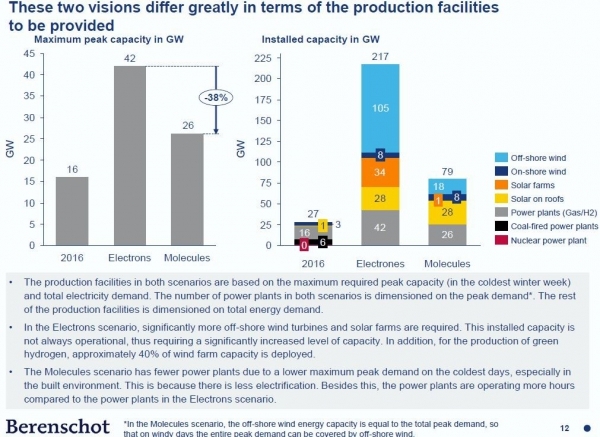 With regard to the “fossil fuel footprint”, in the heat scenario there still is a small role for coal (5bn m³ gas equivalents) and natural gas (5.6bn m³ gas equivalents), and none for oil. Such a hybrid solution would still see gas being used in the built environment, but this would go down from 16bn m³ to 4bn m³. According to Den Ouden, this is an amount that could be supplied with domestically produced biogas. The Dutch gas grid operator Gasunie and power grid operator Tennet, both state-owned, published February 15 their joint study into managing their infrastructure better to address the problems of intermittent renewable generation. Gasunie CEO Han Fennema said: "In order to cope with increasing fluctuations in the energy network we need our gas and electricity infrastructures to be seamlessly aligned. If our Outlook 2050 makes one thing clear, it is that linking Tennet's network to Gasunie's will provide the flexibility required by the energy system; it will also keep the system reliable and affordable." The comments did not come as a surprise, notes Euractiv. 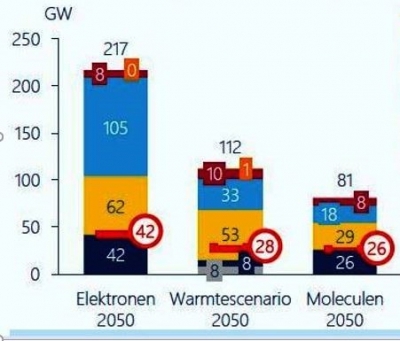 In November last year the European Commission (EC) said in its 2050 strategy, A Clean Planet for all, that wind and solar, combined with nuclear power, would be “the backbone” of a decarbonised energy system by 2050. “The role of gas will not be the same in 2050 as it is today,” Canete said back then. At the 4th EU-Norway Energy Conference in Brussels February 5, Canete also said the EC wants energy consumption to be reduced by 50% in 2050, further putting the squeeze on gas. Equinor's chief economist Erik Waerness warned in Brussels that “80% of our energy today is molecules, not electrons. Remember that if we are not relying on gas in the energy system, the need for massive investments in renewable electricity will be much higher.” He added that it will be “already enormously challenging” for wind and solar to reach 60% of all electricity production in Europe. How will the gas industry evolve in the low-carbon world of the future? Will natural gas be a bridge or a destination? Could it become the foundation of a global hydrogen economy, in combination with CCS? 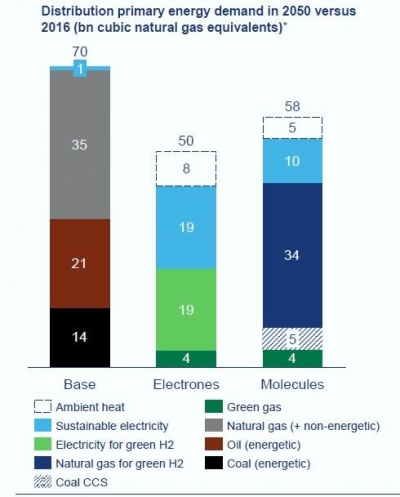 How big will “green” hydrogen and biogas become? What will be the role of LNG and bio-LNG in transport? From his home country The Netherlands, a long-time gas exporting country that has recently embarked on an unprecedented transition away from gas, independent energy journalist, analyst and moderator Karel Beckman reports on the climate and technological challenges facing the gas industry. As former editor-in-chief and founder of two international energy websites (Energy Post and European Energy Review) and former journalist at the premier Dutch financial newspaper Financieele Dagblad, Karel has earned a great reputation as being amongst the first to focus on energy transition trends and the connections between markets, policies and technologies. For Natural Gas World he will be reporting on the Dutch and wider International gas transition on a weekly basis.